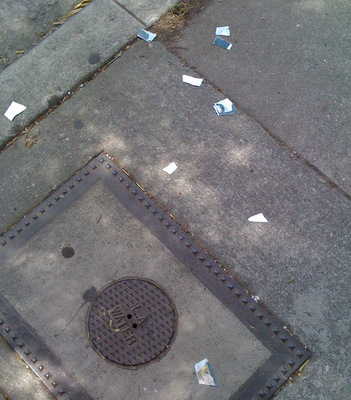 As I walked out of our building Sunday morning, I noticed some bits of paper scattered on the sidewalk. 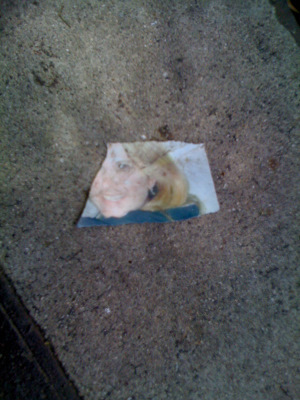 It was a photograph that someone had torn up and thrown on the ground. Curious, I felt compelled to pick up the pieces and re-assemble the picture. It’s impossible to know what percentage of torn-up photos have lost love as their source, but I’m certain that it’s very high. What happened here? Did he dump her? Did she dump him? Or was this a photo discovered by a current girlfriend or boyfriend of one or the other? Or are they still happily together, and the photo was torn up by a jealous third party? What brings someone to the point of tearing a photo into tiny little bits and throwing them on the ground? It’s an act that has a certain finality to it, but the detritus remains and causes ripples in the world, such as strangers happening upon them. The emotional upset and violence of the act are on display for any passerby. And you, reader, have you ever torn up a photograph? Why? Did you regret it later? I have. My girlfriend and I were broken up for a summer, and during that time I started seeing someone else — one of her best friends. A few months after we got back together, my girlfriend found a photo of the other woman from that summer and threw a fit that I’d kept it. 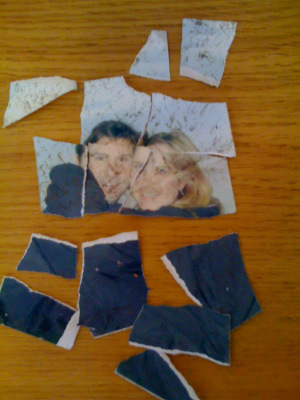 Frustrated and angry, I tore the photo up. I immediately regretted it, and managed some time later to recover the picture by scanning the negative. Once, angered at an ex, I tried to tear up a Polaroid of the two of us. Those things are tough to rip. I then tried to burn it (I was apparently quite dramatic back then), and it began to smell and smoke and our fire alarm went off. She had the last laugh, apparently. Now I just do what all jaded exes do: create a wicker, life-sized effigy of my ex and ritualistically burn it in my front lawn. Anyway, among the few things that I took as keepsakes are a couple of photographs: one of my grandfather and one of my grandmother. I know that both of the pictures were shot with the best intentions, but both are extremely unflattering images that capture some of the discomfort and humility that comes with advanced age. I grabbed the photos with the intention of destroying them, but for some reason, I can’t. The analog in the digital world is the unilateral defriending I think. What I do instead of tearing up a picture is stop liking something they like 4EVAR. Sometimes there is a symbolic gesture initiating the unliking, to wit: leaving a cd of Britten’s Curlew River on a dewy front porch in the Berkeley hills. After a painful breakup with my first girlfriend, I tore up nearly all the photographs I had of her. It felt good at the time, even necessary, but of course later on I wished I hadn’t, as some were irreplaceable. Still, I’m not sure I could have moved forward without doing something drastic like that. I couldn’t let her go for a long time – way too long – and that helped me finally do it. Does anyone else find it kind of weird that Tim decided to re-assemble scraps of trash he found on the sidewalk? I don’t find it strange at all that Tim would reassemble this–I can’t imagine how on earth anyone could resist! Doesn’t anyone read Found Magazine? My sister had a crazy ex who smashed a CD of their favorite song into tiny pieces and left it on her windshield. It just made us fear him. Tearing up a photo, I could never, but I understand the closure impulse. I guess I just resist closure. Jeremy, your scruples amaze me. I have boxes of old photos in my basement–many of me with old long-term exes. I have no desire to destroy them, but I also have desire to look at them. They contain access to distant memories that actually hold very little sway over me, one way or another. Getting ready to move in the coming year, I’m sure I’ll have to make a decision on whether or not these boxes are worth the space they take up.